DESCRIBING Australia's log book laws as "harassment" Bunny Brown has announced his intention to take legal action against the Federal Government. The President of the Australian Long Distance Owner and Drivers Association said he had engaged five lawyers to work on the project. Now he is asking drivers to help his campaign and to support him in changing the laws he says are unfair. He said truck drivers were paying the high price of propping up Australia's revenue streams by being fined for minor log book breaches over and over again. "We can't eat, we can't sleep, we can't get onto the road without being harassed," he said. Brown said the laws needed to change to reflect the contribution that drivers made to the nation. ALDODA formed back in 2000 to give a voice to truckies, improve working conditions and help reduce the road toll. And now was the time to stop waiting for the government to change the laws, he said. "Over the last four years we have been meeting with the various government organisations in all Australian states and territories. "We have been working behind the scenes with these various groups for the benefit of all road users. "As recently as a couple of weeks ago I met with NSW authorities at Yass to consult with them on safety issues. The most important issue at present is the over regulation of the industry. The log book laws are causing most of the safety problems. "Nearly every driver I have spoken to has stated this, when drivers are continually worried about the ridiculous detail and over policing of this log book, large fines and demerit points for not putting a mark in the right place immediately in the log book, the resulting stress causes fatigue, which then results in accidents, both during driving and when loading and unloading. "Why do truck drivers lose demerit points for purely an error in administration, not for bad driving? The stupidity of this law would not be accepted in any other industry. "Highly experienced drivers are walking away from the industry every day, and being replaced by inexperienced people; no wonder the death toll hasn't changed." He said it was getting harder for drivers to stick to the log book and their deadlines with cameras watching them, roadhouses and rest stops becoming fewer, road works and the need to check loads, fuel the truck, take a toilet break and complete truck maintenance. "Truck drivers are human beings not machines you can turn on and off. It is time we were shown some respect from the authorities." "Due to regulations and strict log book laws, roadhouses are closing down as truckies cannot get to these places to eat. Local councils are blocking truck parking areas. When towns are bypassed there's not enough parking areas on highways. "It is time the Government stopped using truckies as a source of revenue and really became safety conscious." 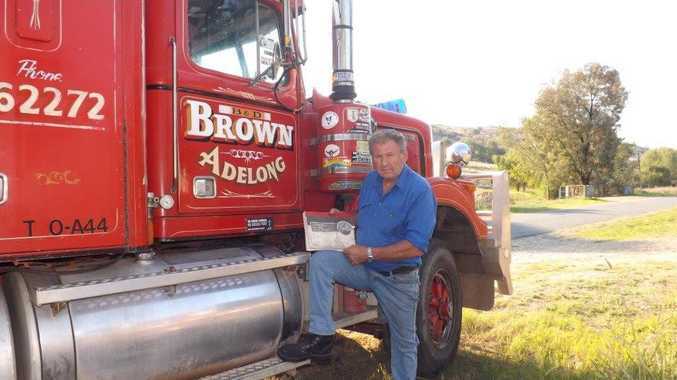 Now Brown is asking all truckies to send their thoughts on the log book, the way it is policed and any other concerns to help with his legal case against the Federal Government. "If you tell us we will keep your name confidential. To make a difference we need as many comments as possible and as much support as you can give us. "To get anywhere regarding this matter we need a lot of input from a lot of people. Now's your chance boys - support us." Email comments to longdistanceownerdrivers@hotmail.com or phone 0438 072 494.